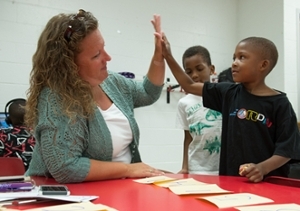 Increased positive social behaviors, improved developmental skills among toddlers and favorable parental support are positive outcomes reported in the Southern Illinois University Edwardsville East St. Louis Center (ESLC) Kindergarten Readiness Camp analysis. The ESLC released a report June 5 detailing the results of its 2016 pilot Kindergarten Readiness Camp, prior to offering the summer program for a second year. The free summer camp is currently in session. It runs from 8 a.m.-1 p.m. weekdays through Tuesday, July 11at Gordon Bush Elementary School, 1516 Gross Ave. in East St. Louis. Breakfast and lunch are served each day. The program, which is designed for children who have little preschool experience, is targeting 80 incoming kindergarteners who are at risk of falling behind their classmates. “We offered the initial program because of the realization that many East St. Louis students enter kindergarten behind grade-level, and we know that SIUE’s Head Start program had skilled educators that could help better prepare more students,” said ESLC Executive Director Jesse Dixon. More specifically, the report cited that 70 percent of East St. Louis children, birth-to-five, do not attend a licensed childcare center. During the Kindergarten Readiness Camp, students had the opportunity to learn, explore and practice skills that they will be expected to master in kindergarten. Youth participated in small group instruction, project based learning/centers, gross motor development and enrichment. Besides socialization and communication skills, the camp teaches students early reading skills, fine motor skills, math skill and a love of learning. In addition, students also perform arts activities and project-based STEM learning experiences. Parents attend weekly campfire chats, and receive tools and resources that will help them support their child’s education at home and school. Families also receive incentives for consistent attendance in the camp and the parent meetings. Planning, recruiting and staffing have taken place in a close relationship with East St. Louis School District 189. In partnership with the St. Louis-based Homeworks! program, the Kindergarten Readiness Camp will include teacher home visits to work with parents around ways to better prepare their kindergarteners to be successful. Curriculum for the program is evidence-based and incorporates the Illinois Learning Standards in social emotional development and approaches to learning. The curriculum includes non-cognitive skills development, language arts, mathematics, physical development, science, and visual and performing arts. The Boeing Company is providing the majority of funding for this year’s camp. 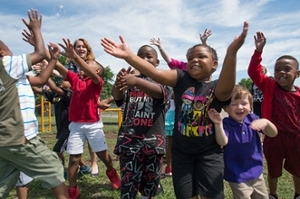 Boeing’s $65,000 grant was given to expand this year’s camp to eight classrooms and 80 students. The pilot program serviced 40 children. Some slots are still available. To register and for more information, contact Johanna Wharton, director of Workforce Development and Strategic Partnerships at the ESLC, at (618) 482-8304 or jwharto@siue.edu. “Parents were overwhelmingly pleased with the support the camp provided around social skills development, and around communicating information and resources to parents about what participants learned in the classroom and how to support that at home,” said Wharton. Kindergarten Readiness Camp students and staff from last year.